A Red Velvet Cake is instantly recognizable with its bright red color offset by a white Cream Cheese Frosting. There are many theories as to its origin. Some say it originated in the South, others say it originated in the North. All we really know for sure is that it has been a favorite for decades. If you look beyond the striking appearance of a Red Velvet Cake, you will find that it has a very mild chocolate flavor (it contains just 2 tablespoons (15 grams) of unsweetened cocoa powder. Buttermilk gives this cake its wonderfully moist and tender crumb. Buttermilk has a thick creamy texture with a rich tangy and buttery taste. You can make a good substitute for commercial buttermilk by adding 1 tablespoon of white distilled vinegar, cider vinegar, or lemon juice to 1 cup (240 ml) of milk and letting this mixture sit at room temperature about 10 minutes before using. Once the Red Velvet Cake has been baked and cooled, I like to chill the layers in the refrigerator until firm before filling and frosting the cake. This extra step makes the spreading of the frosting a much easier task, as a freshly baked cake is quite fragile and when you try to spread the frosting there is a tendency for the cake to tear. Refrigerating the cake first eliminates this problem. I love to frost a Red Velvet Cake with a Cream Cheese Frosting. But the Cream Cheese Frosting I use is a little different than most. What makes it different is that besides cream cheese, it also contains mascarpone cheese and whipped cream. This makes the frosting deliciously rich and creamy. Now, Mascarpone cheese is an Italian cheese that is thick, buttery-rich, delicately sweet and velvety. It is often sold in plastic 8-ounce (227 grams) tubs. You may find it in specialty food stores or in the deli section of your local grocery store. If you cannot find Mascarpone just substitute with 8 ounces (227 grams) of cream cheese. This frosting recipe is adapted from 'The Waldorf-Astoria Cookbook' by John Doherty. 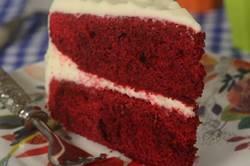 Red Velvet Cake: Preheat your oven to 350 degrees F (180 degrees C) and place the oven rack in the center of the oven. Butter two - 9 inch (23 cm) round cake pans and line the bottoms of the pans with parchment paper. In a bowl, sift the flour with the salt and cocoa powder. In the bowl of your electric stand mixer, fitted with the paddle attachment (or with a hand mixer), beat the butter until smooth. Add the sugar and beat, on medium high speed, until light and fluffy (about 3 to 4 minutes). Add the eggs, one at a time, beating well after each addition. Scrape down the sides and bottom of the bowl as needed. Add the vanilla extract and beat until combined. In a measuring cup, carefully whisk the buttermilk with the red food coloring. With the mixer on low speed, alternately add the flour mixture (in three additions), with the buttermilk (in two additions), beginning and ending with the flour. In a small cup combine the vinegar and baking soda. Allow the mixture to fizz and then quickly mix or fold into the cake batter. Cream Cheese Frosting: In the bowl of your electric stand mixer, fitted with the paddle attachment (or with a hand mixer), beat the cream cheese and mascarpone cheese until smooth. Add the vanilla extract and confectioners sugar and beat until smooth and fluffy. In a clean bowl, using the whisk attachment (or with a hand mixer), whip the heavy whipping cream until soft peaks form. Gradually fold in, or beat, the whipped cream into the cream cheese frosting until smooth and of spreading consistency. Assemble: Place one cake layer (top of the cake facing down) on a 9 inch (23 cm) cake circle and then place on a cake turntable or your serving plate. Spread the cake layer with a layer of frosting. Place the second layer of cake on top of the frosting, top of the cake facing down, and frost the top and sides of the cake.